Miracle Romance MUSIC BOX of Starlit Sky Shiny Cream Gold & Pink Ver. 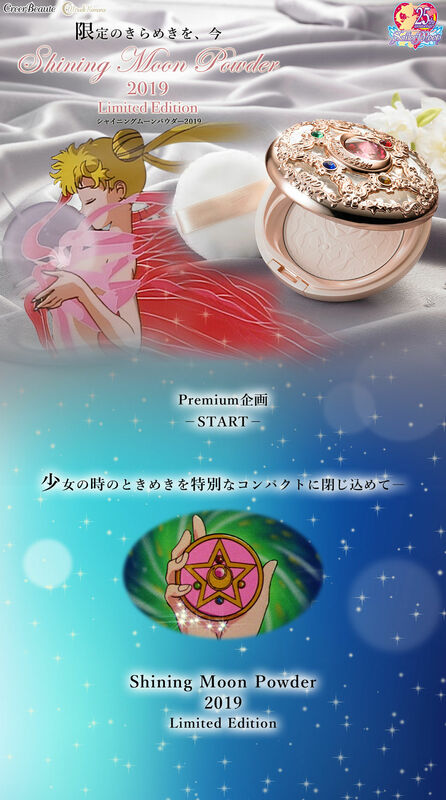 A limited-edition face powder embodying "Crystal Star Compact" as a motif, appearing in the series "TV Sailor Sailor Moon" series. "Crystal Star Compact" which treated a beautiful sculpture that confined the crush of a girl's time. On the other side of elegant pink gold plating, crystal cut shines reminiscent of the twinkling of the transformation. In the beautiful sculpture, the year marked with a limited item is engraved. On the inner side of the compact is a screw-like design that imagines the power of the transformation scene and it sparkles as if you can really transform it. In the powder part, we stamped the ribbon and the pattern of silver crystal delicately. Spherical powder and finish powder with a light and elegant comfort of pearl blending with good familiarity to the skin, if you lick it, make it a natural glossy skin with transparency. If superimposed, it will finish in a fine ceramic skin wearing the light veil of fluffy. Five carefully selected beauty ingredients are compounded. I was very hesitant to spend this much money, but when I received this compact it was totally worth it! So beautiful! If you’re hesitatating, stop! Buy it while it’s available here, and avoid paying a markup, you won’t regret it!